Our all-inclusive kitchen cleaning services will be serviced by our trained crews who will clean your commercial kitchen look its best. It includes cleaning of all types of equipments, ceilings, walls, floors by chemical, power washing or polishing. Pro Duct Cleaning works with all types of budgets; daily, weekly, biweekly, or monthly service to fit all budgets. Impressions are made even before your customers get to your business. Don't ignore grease, dirt, stains and gums on your parking lots, sidewalks and entrances to your business. Pro Duct Cleaning will powerwash these areas so that you can maintain the best appearance of your business. The hood exhaust fan belts will have normal wear and tear. At Pro Duct Cleaning, we will inspect your hood exhaust fan belt at each service. The broken fan belt can cause the entire vent hood system to a screeching halt. The belt in the picture on the right was found during cleaning inspection and with all those visible cracks, it is only a matter of time before it breaks. Then the operation of the business will be interrupted and an emergency repair service call have to be made. All interior surfaces of the exhaust system need to be accessible for cleaning and inspection. To best achieve this, access panels should be provided at the sides or at the top of the duct, whichever is more accessible, and at changes of direction. 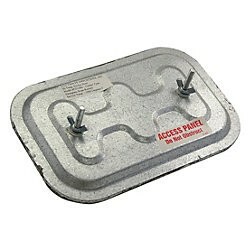 The access panels should be made of same material and thickness as the duct. The access panels should be large enough to permit thorough cleaning and shall be at 12 feet intervals. Upon inspection of your vent hood system, Pro Duct Cleaning will install access panels if your current system requires one. Hood filters are located above the cooking surfaces and act as a fire barrier between the cooking surface and the duct and the rest of the exhaust system. They must be in place during all periods of cooking and need to be regularly removed and cleaned by the restaurant staff to remain fire-safe. The frequency of this cleaning will depend on the type and volume of cooking. When the filters need to be replaced, Pro Duct Cleaning will replace the existing filters with steel baffle grease filters. If your current hood exhaust fan does not have a hinge kit system, Pro Duct Cleaning will install hinge kits on your hood exhaust fan. Call us to get a free estimate. A grease containment system will protect the areas around the fan and the roof from grease damage. 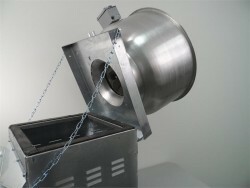 They are designed to capture the grease and oils that will flow out of the hood exhaust fan. 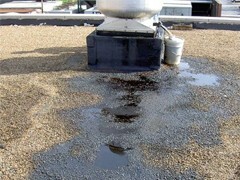 The overflow of the grease from the exhaust fan can cause extensive damage to the roof of the property and its gutters as the photo shows on the right. In addition, it can also create a hazardous environment for the people who frequents the roofs such as vent hood cleaners, maintenance person or roof repairers. To properly protect your investment, the entire kitchen exhaust system needs to be cleaned on a regular basis and the exhaust fan should have grease containment system in place. 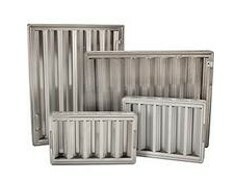 If your kitchen hood system does not have a grease containment system, contact Pro Duct Cleaning to install it for you. We Are Certified, Insured, and Bonded. © 2014 Pro Duct Cleaning. All Rights Reserved.